In a world of uncertainty, pain, and struggle, where do you find solid assurance and unshakeable truth? In "The Shelter of God's Promises DVD-Based Bible Study," gifted Bible teacher and inspiring speaker Sheila Walsh primes Scripture for what God has promised us, what God's promises mean, and how these promises provide the foundation for daily confidence, joy, and hope. With engaging video and rich Bible study content, Sheila weaves powerful personal testimony with Scripture to help you gain a trust in God that will sustain you for a lifetime. 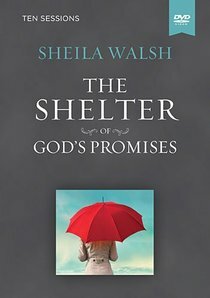 In The Shelter of God's Promises DVD-Based Bible Study, gifted Bible teacher and inspiring speaker Sheila Walsh primes Scripture for what God has promised us, what God's promises mean, and how these promises provide the foundation for daily confidence, joy, and hope. About "Shelter of God's Promises (Dvd Based Bible Study)"